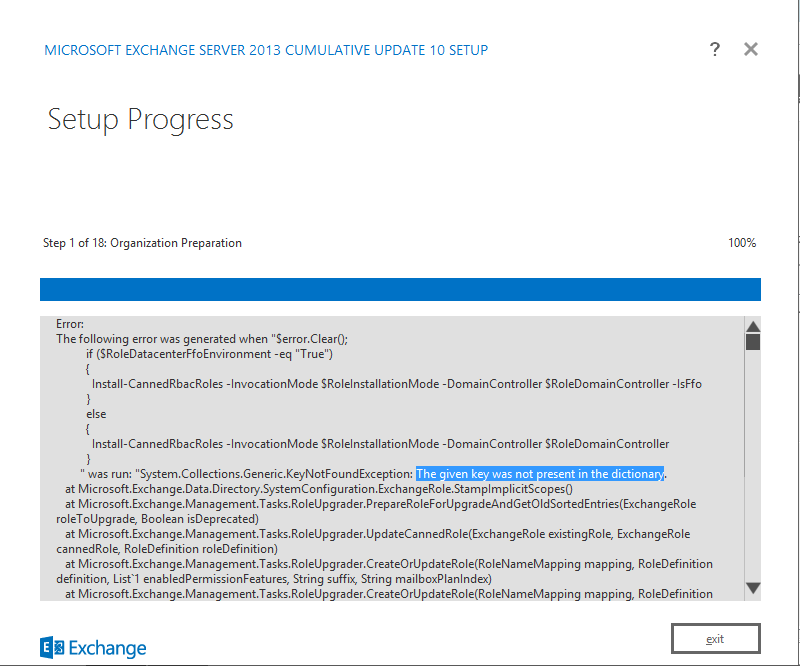 I wanted to install Exchange 2013 CU10 on my lab. But i get the following error. [09-22-2015 11:31:09.0224]  Saving object “My Marketplace Apps” of type “ExchangeRole” and state “Unchanged”. [09-22-2015 11:31:09.0240]  Used domain controller DC01.wardvissers.local to read object CN=My ReadWriteMailbox Apps,CN=Roles,CN=RBAC,CN=First Organization,CN=Microsoft Exchange,CN=Services,CN=Configuration,DC=wardvissers,DC=local. [09-22-2015 11:31:09.0271]  [ERROR] The given key was not present in the dictionary. [09-22-2015 11:31:09.0271]  [WARNING] An unexpected error has occurred and a Watson dump is being generated: The given key was not present in the dictionary. At this moment i found no solution for it.